A presidential aspirant of the New Patriotic Party (NPP), Professor Kwabena Frimpong-Boateng, has stated that delegates to the congress to elect the party's flag bearer will not base their choice on monetary inducements. "The delegates are listening and comparing what we (the aspirants) say with what we have done and can do for the country and party," he said. 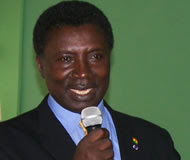 Speaking in an interview in Accra, Prof. Frimpong-Boateng said anybody who claimed he was on top must be joking. According to him, from his interaction with members of the party throughout the country, it was evident that the members had been disappointed and therefore want someone they could trust, someone who would help them build their future. "They tell you no one can buy their conscience and they also know that it is God who establishes kings and will be using them to elect the flag bearer of the party," he added. Prof. Frimpong-Boateng said he was happy with what was taking place on the ground, stressing that "I am doing very well. I am in to win and will win with God's help." When asked to comment on the results of opinion polls being conducted on supposed leading candidates, he said, the pollsters were "Whistling in the dark". "I believe they are scared and want to put up an appearance of being brave," he stated. According to him, opinion polls are very expensive to conduct and that if one knows the source of funding for the opinion polls, one could predict the outcome. As to why his campaign message has centred on science and technology, Prof. Frimpong-Boateng says everything in nature revolves around science and that until Ghana adopts science and technology, "We cannot survive." He said science is the factor accounting for the difference between developing countries and the developed ones and that the poverty gap is essentially a technological gap. He added that during the recent devastating floods in the country, it took the assistance of French helicopters to reach inaccessible areas. Prof. Frimpong-Boateng adds that to do anything in education, health, agriculture, environmental sanitation, water resources, renewable energy, among others, technology is required. He says because the country does not have the technological know-how, its imports far outstrip its exports, adding that although the country is endowed with abundant natural resources, those resources are exported in their raw form for far less the value if the country were to refine them. Prof. Frimpong-Boateng vigorously asserts that science and technology is needed to teach history and archaeology also. "We pride ourselves as a football nation and yet we cannot even-manufacture a football,” he lamented. Prof. Frimpong-Boateng said it was because of the science and technological gap that he had decided to champion it when elected flag bearer and later as President of the Republic of Ghana. According to him, eight years as President of Ghana would be enough to do many things to chart a new path for Ghana's development. "We can develop a machine tool centre within a year, start manufacturing small machine parts and develop the capacity to make implements," he added.